CCC Brought Christine Sanok Out of Retirement–and Took Her to Italy! It’s never too late to go back to school! Christine Sanok heard about CCC’s culinary program at her retirement dinner, from a friend who had heard her mention culinary school before. Surprisingly, Christine’s friend didn’t recommend the expensive private school in San Francisco that she herself had attended. Christine was already a longtime on-again, off-again Comet. She came here after graduating from Richmond High School in 1973. “I was a cheerleader,” she remembers. The whole nine yards.” But, a move to Oakland pulled her out of CCC after just one semester. In the late 80s, she came back to CCC to pursue a degree in business administration, but family obligations put those plans on hold. 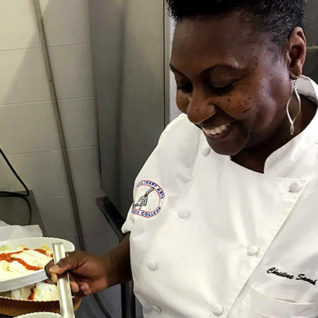 Then, just one month into retirement, Christine started CCC’s culinary arts program. She thought right. Christine says the program has taught her how to be a better, safer, more organized and efficient cook. She even makes her own ingredients like mustard and mayonnaise, now. Christine stresses that it’s a very structured, rigorous program, as well. But, it also offers plenty of fun, memorable experiences. As a server in Aqua Terra Grill, CCC’s teaching restaurant, Christine served an executive chef from Google, who is himself a CCC graduate. “He had nothing but wonderful things to say about the program,” she remembers. And, she got to work with famous chef Martin Yan at a special event. Representing the school well is especially important, she says, if you hope to join the culinary department’s annual trip to Italy, where students learn at two different culinary academies abroad. This semester will be Christine’s last in the culinary program. She’s finishing her certificate now, because she wants to walk with her classmates at graduation. After that, she’ll take three more general education classes to get her associate degree.